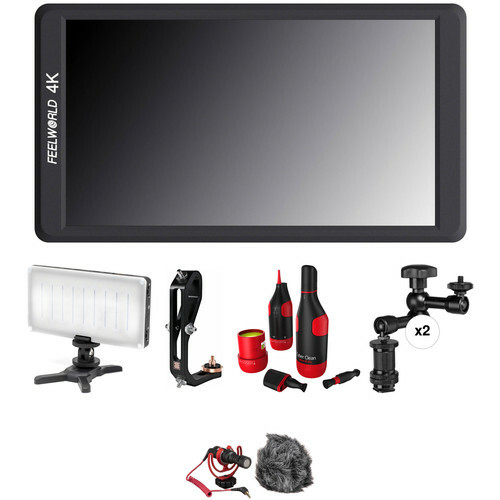 The FeelWorld F570 5.7" 4K On-Camera Monitor + SIMPLY GIMBAL Adapter & Accessories Kit from B&H features a compact monitor and an L-shaped handgrip that secures on the bottom of your gimbal and provides four 1/4"-20 threads for mounting accessories. The kit also includes a pocket-sized 3200 to 5600K LED light with USB power and charging ports, a Rode VideoMicro compact on-camera mic, two 7.5" articulating arms, and a camera cleaning set for removing smudges, fingerprints, dust, and debris from your camera and lens gear. The monitor, light, mic, and other accessories can be attached to the gimbal handgrip to provide you with a more complete shooting setup. The F570 5.7" IPS 4K HDMI On-Camera Monitor from FeelWorld features a display resolution of 1920 x 1080. The IPS screen allows for off-axis viewing of 85° up/down/left/right, and it features a brightness of 460 cd/m2 with a contrast ratio of 1400:1. The monitor incorporates an HDMI input with a loop-through HDMI out. The F570 features many useful functions into its small size including peaking, zoom, anamorphic de-squeeze, frame lines, markers, and image flip. The monitor includes a Mini HDMI cable, sunshade, shoe mount, and an F970 L-Series battery plate. The GVB Gear PL60B Pocket-Sized On-Camera Light with USB Charging/Power is a compact bi-color fixture that mounts onto your camera's hot shoe or the included base. It features an integrated 5000mAh battery that charges via USB. You can also use the fixture to charge/power mobile devices via its USB and USB Type-C connectors. The PL60B features 30 tungsten-balanced and 30 daylight-balanced LEDs with a 120° beam spread. The PL60B is locally dimmable on the unit itself and included with the PL60B is a diffuser that magnetically attaches to the fixture. An included shoe mount enables mounting the light onto your camera or onto the base that is also included with the fixture. The Simply Gimbal FMJ Handheld Gimbal Adapter for Mounting Monitors, Microphones, and Accessories is a handgrip that enables mounting accessories to your gimbal without affecting its operation. The handgrip features a removable, copper-colored mounting adapter that enables you to mount your gimbal to the handheld adapter, as a rubber washer provides a strong grip. On the bottom of the copper adapter is a female 1/4"-20 mounting hole which can be used for a variety of accessories including an optional mini-tripod. The handgrip itself incorporates four 1/4"-20, double-sided, threaded mounting holes so you can mount accessories directly to the handgrip. This adapter allows you to add accessories to your gimbal and improve operation. Keep your lenses and camera clean with the Complete Camera Cleaning Kit from GVB Gear. This all-in-one main body houses all the tools you need for cleaning. Under the protective cap, you can find the lens cleaning head, which comes with five replaceable microfiber patches, to clean smudges and fingerprints off the surface of optical glass. Reversing the lens cleaning head reveals a 3mm anti-static carbon brush that removes dust without scratching the glass. Removing the lens cleaning head and carbon brush altogether exposes the air blower nozzle, which also carefully removes excess dust from the interior and exterior of a camera body by squeezing the silicone sides of the main body. Use the 110g of cleaning compound, which is stored in the bottom cap of the kit, to remove whatever leftover debris you could not remove. The Pearstone 7.5" Articulating Arm is an arm used to mount small displays on prosumer and professional camcorders. The arm's unique design features a single-point locking mechanism, which gives the user maximum flexibility. Moving the display on multiple axes is quick and easy, allowing users to find the best possible viewing angle. In addition, the bottom verticle spacer piece is removeable to reveal a 1/4"-20 male screw, and the bottom shoe mount is removeable to reveal a 1/4"-20 female thread. The full length of this arm (tip-to-tip) measures 7.5", and the usable extension range (end-joint to end-joint) measures 4.2". Box Dimensions (LxWxH) 7.6 x 3.7 x 2.0"
Box Dimensions (LxWxH) 8.3 x 6.3 x 1.75"
Box Dimensions (LxWxH) 7.8 x 3.4 x 2.8"
Box Dimensions (LxWxH) 5.65 x 3.1 x 1.7"